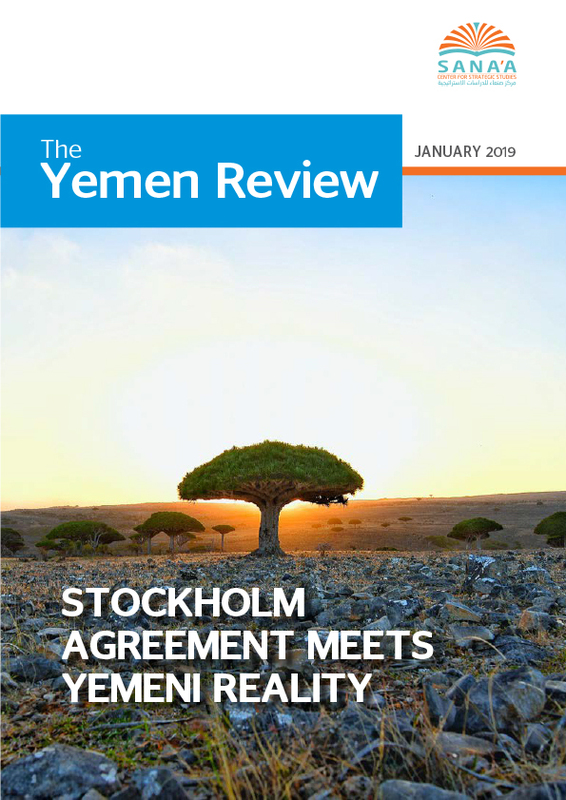 In January, the United Nations focused its Yemen-related efforts on implementing the Stockholm Agreement. The deal was reached in December at UN-sponsored peace talks in Rimbo, Sweden, between representatives of Yemen’s main warring parties – the armed Houthi movement and the internationally recognized Yemeni government. In it, both sides committed to a ceasefire in Hudaydah and a mutual redeployment of forces away from the port city, a prisoner exchange, and a statement of understanding regarding the city of Taiz. Clauses in the text of the agreement, however, contained a degree of ambiguity that left them somewhat open to interpretation, a factor that became increasingly problematic as the UN sought to implement the agreement and hold the parties accountable to their commitments. As January progressed the challenges became apparent: deadlines for the implementation of the Hudaydah agreement were missed, the ceasefire was interrupted, the prisoner exchange was delayed, and fighting raged in and around Taiz City. As well, General Patrick Cammaert of the Netherlands, chair of the Redeployment Coordination Committee (RCC) that was formed to support and facilitate implementation of the Hudaydah agreement, said he would leave his post just five weeks after his appointment. On December 31, 2018, UN Secretary-General Antonio Guterres submitted a proposal to the UN Security Council (UNSC) on how the UN would support the implementation of the Stockholm Agreement. The UNSC requested the proposal on December 21 as part of Resolution 2541, which endorsed the agreement and authorized the deployment of an advance monitoring team, the RCC, to Hudaydah. Led by Cammaert, the team arrived in Yemen on December 22. The committee was tasked with overseeing the redeployment of forces, monitoring the ceasefire, ensuring security in the city, and opening up humanitarian access routes. Guterres’ plan proposed sending 75 UN observers to Hudaydah for a period of six months. According to the proposal, the UN Mission to support the Hudaydah Agreement (UNMHA) would be a “nimble presence.” The mission would be tasked with monitoring the compliance of parties to the ceasefire, the redeployment of belligerent forces from Hudaydah City and the ports of Hudaydah, Saleef, and Ras Issa, and mine action operations. In addition, the UNMHA would seek to establish and assess facts and conditions on the ground in an objective manner and engage with all relevant parties. The mission would report to the Secretary-General through the Special Envoy for Yemen Martin Griffiths and Under-Secretary-General for Political Peacebuilding Affairs Rosemary DiCarlo. Guterres also proposed that following the redeployment of warring parties from Hudaydah, the Yemen Rea Sea Port Corporation would take over management of three ports in the governorate: Hudaydah, Saleef, and Ras Issa. The UN, supported by the World Food Programme (WFP), would provide oversight and technical assistance to manage the ports. The WFP said in a report published on December 31 that it was waiting for authorities in Sana’a to approve staff visas before deploying an initial assessment team to Hudaydah in January. The WFP staff had yet to receive visas as of this writing, according to a Sana’a Center source aware of the proceedings. On January 9, UN Special Envoy for Yemen Martin Griffiths briefed the UNSC on progress in implementing the Stockholm Agreement. Griffiths said that after meeting with the leaders of both main belligerent parties – including Houthi leader Abdulmalek al-Houthi during a two-day visit to Sana’a on January 5-6, and Yemeni President Abdo Rabbu Mansour Hadi in Riyadh, Saudi Arabia on January 7 – they had each committed to implementing the UN agreement. The Special Envoy said the ceasefire in Hudaydah had largely held, with some exceptions, which had significantly decreased the level of violence. Regarding Taiz, Griffiths said humanitarian aid access needed to increase, but that to address this and other issues he hoped to convene first meeting of a committee on Taiz by the end of the month. Griffiths also said another supervisory committee meeting for the proposed prisoner exchange would be held in Jordan the following week. On January 16, the UNSC unanimously approved Guterres’ proposal to support the Stockholm Agreement, adopting UNSC Resolution 2542 (2019). The text of the resolution was submitted by the United Kingdom, which has served as pen holder for the Yemen file at the UNSC since 2011. In voicing support for the technical resolution, permanent council members the United States, France and China also advocated the need to step up humanitarian assistance efforts. Despite the ceasefire largely holding on the ground in Hudaydah, there was little progress toward the redeployment of warring parties away from front lines in the city. The original deadline for redeployment – January 8 – was not met. UN officials told the Associated Press (AP) that the work of the RCC and its head of mission General Cammaert was hindered by restrictions on their movement on the ground. While the RCC held two meeting sessions – in late December and early January – in Houthi-held territory, Houthi authorities refused to attend the subsequent RCC meeting in government-held territory on January 8, forcing Cammaert to shuttle between the warring parties. The UN then chartered a boat, which it anchored in the Red Sea, to have a neutral venue acceptable to both sides. Meanwhile, in an illustration of the uncertain security situation and the difficulties the UN mission is facing, Cammaert’s armored vehicle was struck by a bullet in Hudaydah on January 17. The head of mission and his team were leaving a meeting with representatives of the Yemeni government when the incident occurred. No one was harmed, and in response, Cammaert called for calm and the need for the warring parties to strengthen the ceasefire agreement, according to UN spokesman Stephane Dujarric. The spokesman also reiterated that “all the parties in Yemen are responsible for the safety of all UN personnel.” The UN said it had no information about the source of the fire, while Houthi forces and the Yemeni government accused each other of firing the shot. Localized fighting also continued in the first month of 2019, albeit not leading to any frontline changes. Each side accused the other of violating the shaky truce in clashes largely centered on the eastern and southern outskirts of the city and the Red Sea governorate’s southern districts — particularly Durayhimi, At-Tuhayat, Al-Jah and Hays. The Yemeni government claimed to have recorded 745 ceasefire violations between December 18 and January 25, and said that Houthi forces continued to bolster their positions by digging trenches, erecting barriers and planting landmines. Houthi media published daily reports of alleged breaches by coalition-backed forces and claims that government-aligned forces have reinforced their positions to the southeast of Hudyadah airport and in the vicinity of the May 22 Hospital in the city’s eastern suburbs. The RCC, which is tasked with monitoring the implementation of the Hudaydah Agreement, has not assessed claims of violations by either side. The UN Secretary General’s January 7 and January 21 reports, however, highlighted the contested town of Durayhimi — located 15 km south of Hudaydah City — as the site of the majority of ceasefire breaches. Accusations were traded over a fire at Hudaydah’s Red Sea Mills in the east of the city, where the World Food Programme is currently storing 51,000 metric tons of wheat. Two silos were damaged in the fire, which was reported on January 25, with the Saudi-led military coalition claiming a Houthi mortar attack was the cause and a Houthi official blaming coalition artillery fire. The storage facility, which is located close to the frontline between Houthi and government-aligned forces, has been inaccessible since September due to fighting and Houthi landmines in the vicinity. The Houthis said that on January 29, their demining team came under fire while working in the area around the Red Sea Mills, while the coalition countered that Houthi forces attacked a UN-backed team. Neither the UN nor the WFP has commented on the reports (see below ‘Fire Damages WFP Food Aid in Hudaydah’). However, Sana’a Center sources aware of the proceedings said Cammaert and the Special Envoy had clashed at times over the methods of implementing the Hudaydah agreement and the roles of various UN agencies in the implementation. The lack of clear clauses in the agreement has proven to be a challenge, as the ambiguity allowed different interpretations. The UN Secretary General’s proposal for the UN Mission called on UN bodies to coordinate to support the Stockholm Agreement, but there has been a lack of consensus among UN entities on the roles and the level of involvement each should have, according to the same sources. On the ground in Hudaydah, persons close to the proceedings told the Sana’a Center that Houthi authorities also grew frustrated with Cammaert. In one situation, Houthi authorities tried to prevent Cammaert from visiting the fire at the Red Sea Mills on the eastern outskirts of Hudaydah City, however the Dutch general had insisted. General Michael Anker Lollesgaard of Denmark was appointed at Cammaert’s replacement on January 31, and arrived in Hudaydah in early February. Lollesqaard was a Force Commander in the UN Multidimensional Stabilization Mission in Mali in 2015 and 2016. In his previous briefing to the UNSC on December 14, the Special Envoy suggested that a prisoner swap between the warring parties could involve some 4,000 captives and take place by mid-January. However, following logistical delays, including slow approval from Jordan to host the prisoner exchange committee, the party representatives met in Amman on January 16-17 to discuss steps to implement the exchange. On January 16, Reuters reported that the two sides had exchanged lists of some 15,000 names. Days later the head of the Yemeni government delegation said that a final deal was expected by the first week of February. According to the Stockholm Agreement, prisoners will be transferred via the Houthi-controlled Sana’a International Airport and the government-controlled Saiyun airport. The International Committee of the Red Cross (ICRC) and UN will oversee the exchange, with the head of the government delegation saying the agreement to do so would likely be finalized by early February. To assist the operation, the ICRC said it would provide 15 additional delegates and two planes, each with a capacity of 200 passengers, to shuttle detainees between Sana’a and Saiyun, according to a January 23 statement by Fabrizio Carboni, the regional director for the Near and Middle East for the ICRC. However, Carboni noted that these preparations would be “meaningless” unless the parties finalized the lists of detainees. On January 29, Houthi forces released captured Saudi soldier Mousa Awji, who was in need of medical attention. Following Awji’s transfer from Sana’a to Riyadh, facilitated by the ICRC, Saudi Arabia released seven Houthi prisoners. However, as of this writing, the larger prisoner exchange deal had not been finalized. As part of the Stockholm Agreement, the belligerents agreed to a “Statement of Understanding on Taiz.” According to the statement the parties pledged to form a joint committee with UN participation, including representatives from Yemeni civil society, with the committee to then determine its working mechanism and missions. The agreement lacked a timeframe or any clear terms of reference, and since the Stockholm Agreement there have been no announced steps taken to form the committee for Taiz. Instead, Taiz saw an escalation in hostilities toward the end of 2018, which continued into the new year. Fighting between Houthi and government-aligned forces was concentrated in the southeast Hayfan district, the northwestern Maqbanah district and western Mawza district, though resulting in little frontline movement. There were increased clashes within Taiz City itself; on January 22, an alleged Houthi shell hit Freedom Square in the southeast of the city, killing more than a dozen civilians. On January 28, the UN Special Envoy gave an interview with Asharq Al Awsat in which he said his level of optimism regarding the implementation of the Stockholm Agreement remained “10 out of 10… We need to remain hopeful and have faith in the process that we started.” In explaining the delays in implementing the agreement, Griffiths said the timelines had been ambitious and pointed to the complexity of the situation on the ground. In Sweden, the warring parties had agreed to hold another round of talks in January. At the end of the month, however, the Special Envoy said that there needed to be more progress on implementing the Stockholm Agreement before the next round of talks could be held. As of this writing, no arrangements have been set for further consultations. On January 30, the Saudi-led military coalition said it was ready to use “calibrated force” to compel the armed Houthi movement to abide by the Stockholm Agreement and withdraw its fighters from Hudaydah. As of writing, there had been no redeployment of forces away from the city, while the proposed humanitarian corridor between Hudaydah and Sana’a remained closed. Fresh challenges to the Yemeni government’s ability to implement coherent economic policy emerged last month, as a feud between the heads of the central bank in Aden and the government-appointed Economic Committee spilled out in public accusations of corruption. The government established the Economic Committee in August 2018 for the express purpose of advising and assisting the Aden central bank in stabilizing the Yemeni rial. However, on January 20, committee head Hafedh Mayad posted online a memo that he had sent to the Yemeni prime minister, asking the latter to direct the Anti-Corruption Commission to open an investigation into the Aden central bank. At issue were central bank purchases of some 448.5 million Saudi rials (SR) from the local market in November 2018. The bank had mobilized some YR 75 billion to buy the foreign currency to finance letters of credit for importers, a senior banking source in Aden told the Sana’a Center. Mayad, however, accused the central bank of paying above market price for the SR, with the difference between the market price and the price paid being valued at roughly 9 billion Yemeni rials (equivalent to roughly US$14.4 million relative to the average November 2018 exchange rate). An initial Sana’a Center review, however, suggested that there had been no impropriety. The Yemeni rial had appreciated significantly throughout November 2018. Meanwhile, as the central bank was purchasing SR that month there was up to a 48 hour delay between when the bank agreed a purchasing price with currency vendors and when the actual trade of currencies was made. Thus, by the time of the actual trade the relative value of the currencies had often changed somewhat from the agreed price. This is the difference Mayad had erroneously interpreted as overpayment. Despite this, following Mayad’s public accusation fear spread in the market of economic mismanagement at the Aden central bank. Senior banking sources in Aden told the Sana’a Center that currency traders themselves stoked these fears to depreciate the rial further, allowing them to purchase Yemeni rials at artificially low prices. The central bank in Aden compounded this market sentiment by not addressing the corruption allegations publicly. Meanwhile, in northern Yemen, the Houthi-run Yemen Petroleum Company (YPC), through the Payments and Foreign Currency Committee, increased its purchases of foreign currency in January to place new fuel import orders. A senior banking official in Aden estimated that the Houthi authorities purchased between SR 110 million and SR 130 million between January 23 and February 3. All the above factors helped force the market value of the YR lower in January, with the Yemeni currency beginning 2019 valued at roughly YR527 per US$1 and ending the first month of the year trading at YR570 per US$1. On January 22, the UN Humanitarian Coordinator for Yemen, Lise Grande, informed the Governor of the central bank in Aden, Mohammed Zammam, that the UN would channel humanitarian aid through the bank. The announcement was an agreement in principle with the details, such as the management framework and transparency mechanisms, yet to be determined. Since the escalation of the conflict in March 2015 and the cessation of most oil exports, the international community has become the second largest source of foreign currency in the local market – the first being remittances. Most of the money that the donors allocated for humanitarian assistance in Yemen was channelled via the UN through its various agencies, and deposited in Yemeni commercial banks. In 2018 along, UN aid funding for Yemen totalled almost US$3 billion. The International Bank of Yemen (IBY) in particular has handled the largest share of these foreign transfers into Yemen, given its pre-established relationship with the international donor community. According to estimates that a number of senior banking officials provided to the Sana’a Center, over the course of the conflict IBY has handled up to US$1 billion annually from donors over the course of the conflict. Channeling such a large source of foreign currency through the central bank in Aden should help the bank to better regulate the currency market and stabilize the Yemeni rial exchange rate. On January 13, the internationally recognized Yemeni government ordered the relocation of the state-run telecommunications company, TeleYemen, from Sana’a to Aden. According to a Sana’a-based source working in the telecommunications sector, the Houthi authorities in Sana’a stand to lose an estimated YR27 billion of the firm’s annual revenues. In January the Yemeni government secured a year-long extension for a $60 million monthly fuel grant from Saudi Arabia for the provision of electricity in government controlled areas, according to a senior Aden-based banker who spoke with the Sana’a Center. Early January: By the second week of January the central bank in Aden had made US$190m available in new financing of fuel and food importers, according to a well-informed Sana’a Center source. Importers themselves, however, appear reluctant to access the funds. Importers have expressed frustration regarding prolonged delays in the central bank processing import applications and issuing letters of credit. January 12: The Governor of the Central Bank in Aden, Mohammed Zammam, stated that a total of US$441 million has been withdrawn from the US$2bn Saudi deposit thus far. In 2018 alone, US$314 million was withdrawn from the Saudi deposit; 61 percent of this was allocated to fund wheat imports while 20 percent was directed to rice imports. Since early December of 2018, the Central Bank in Aden has been offering a preferential exchange rate of YR440 per US$1 to import six essential food commodities: wheat, rice, sugar, cooking oil, corn and milk. On January 19, clashes broke out between units belonging to the Ataq Military Axis and forces loyal to the Belabid tribe near an OMV oil production facility in Arma, northern Shabwa. Fighting began after Belabid tribal forces attempted to block the passage of crude oil tankers from the site in Yemen’s Block S2, where Austrian oil and gas company OMV resumed production last year. The tribesmen have demanded a role in delivery contracts, and began a sit in on January 23. Crude transport and provision of security around oil facilities in Yemen have long been a source of lucrative contracts, and the recent clashes in Shabwa highlight both potentially destabilizing local competition and questions over distribution of the spoils of renewed crude production. In government-held areas of Taiz City, violence continued as various anti-Houthi groups competed for influence and territory. On January 9, gunmen on a motorcycle assassinated a government soldier in the September Street area, marking the first assassination of the year after a wave of targeted killings in 2018 prompted a security crackdown in the governorate. The day before, Brigadier Jamal al-Shamiri, commander of Taiz’s police force, survived the latest attempt on his life in the west of the city. On January 28, gunmen attacked a military police prison in the city, shooting dead a detained government soldier who was suspected of belonging to the so-called ‘Islamic State’ group, or Daesh. In mid January a campaign against “extremist elements” began in Taiz City, led by the 35th Armored Brigade — a Yemeni army unit that operates in coordination with the UAE-backed Abu Abbas Brigades. Abu Abbas’ forces killed Anas Adel Abdul Jabbar and Walid Atef on January 19 in Al Mudhaffar district to the west of Taiz City. The two men were wanted by local police in relation to the assassinations of government military and security personnel in Taiz. Days later, there were reports of a wider campaign against alleged AQAP operatives in Taiz. Abu Abbas, whose forces are leading the campaign, is himself sanctioned by the US Treasury Department for alleged links to AQAP and ISIS — allegations that Abbas denied in a rare interview at the end of 2018. The first month of 2019 also saw escalations on other fronts. A Houthi unmanned aerial vehicle (UAV) attack on al-Anad air base in Lahj on January 10 killed six soldiers and injured more than ten others. Among those killed was the Yemeni government’s military intelligence chief, General Mohammed Tamah and the Yemeni army’s deputy chief of staff, Major General Saleh al-Zindani, who died later in hospital. A number of high-ranking Yemeni government military figures and local officials were present at the air base at the time of the attack, where a military parade was taking place. The Yemeni government said that a local Houthi cell had orchestrated the attack and announced arrests the following week. A day after the attack in Lahj, Houthi media claimed that a Houthi UAV hit Saudi military positions in Asir, southern Saudi Arabia. Houthi forces spokesman Yahya Sarea threatened further UAV attacks in 2019, which he dubbed the “year of the drones.” Since mid-2018, the Houthis have demonstrated growing UAV capabilities, mainly through the use of kamikaze (ramming) drones. While Sarea claimed that these weapons were locally manufactured, the Qasef K-2 drone used in the Al-Anad air base attack is an update on the Qasef-1 — a UAV that the UN Panel of Experts on Yemen said includes parts supplied by Iran, and is “virtually identical” to the Ababil-T Iranian drone. Tehran denies supplying drone or missile technology to the Houthis. The UN Panel of Experts report circulated in January also noted that Houthi forces have been increasing their use of remote-control waterborne improvised explosive devices in the Red Sea against both military and civilian vessels. The Saudi-led coalition launched a series of airstrikes on Sana’a on January 19-20, which local eyewitnesses said were the most destructive of their kind in more than a year. The Saudi-led military coalition said that the strikes targeted military sites, including Al-Daylami air base and a UAV storage facility — indicating a retaliation to Houthi airborne attacks in previous weeks. On January 31, coalition jets bombed an alleged drone storage facility east of Sana’a city. The spokesman for the Saudi-led military coalition, Colonel Turki al-Malki, said that this was part of an ongoing operation to eradicate the Houthis’ drone capabilities following the attack in Lahj. During January, coalition fighter jets also targeted a Houthi training camp in Dhamar governorate and Houthi gatherings and positions in Al-Jawf, Hajjah and Sa’ada, supporting continuing ground fighting in these governorates, and Nihm front in Sana’a. January 4: Two members of the UAE-backed Shabwa Elite forces were killed in clashes with tribesmen in Marqa district, northwest Shabwa, following attempts to arrest two men. Following the clashes, Emirati Apache helicopters bombed houses in the area, killing seven civilians. Minister of Interior Ahmed Al-Maysari said that a commission would investigate the incident. January 20: The accidental detonation of a mine killed five demining experts in Marib. The two South Africans, one Croatian, one Bosnian and one Kosovar killed in the blast were working for the “Saudi Project to Demine Yemen,” a Saudi-funded KSrelief project. January 28: An explosion at a market in the government-held Mocha city, Taiz governorate, killed at least six civilians. Local officials suspect AQAP may have carried out the attack, although no claims have been made, while the Yemeni government’s Saba news agency blamed Houthi forces. The UAE has a heavy security presence in Mocha, which lies some 75 km north of the Bab al-Mandab strait. The port city also serves as a base to support coalition operations in neighboring Hudaydah governorate. On January 9, the UNSC was briefed by Under-Secretary-General for Humanitarian Affairs and Emergency Relief Coordinator Mark Lowcock. Despite some positive indications following the Stockholm Agreement, Lowcock said the wider humanitarian situation in Yemen had not improved. Some 80 percent of Yemenis need humanitarian assistance, 10 million are on the brink of famine while more than 3.3 million remain displaced as result of the conflict. In response, the WFP plans to expand its operations in 2019 to reach 12 million people, Lowcock said. He called on the international community to consider additional funding for the 2019 Humanitarian Response Plan at an upcoming February pledging conference. While commending the progress made on the political front, Lowcock lamented that more focus was required on the humanitarian elements of UNSC Resolution 2541. The Under-Secretary said all parties must work for increased humanitarian access and the unfettered movement of aid workers and supplies. Lowcock called for access to Yemen’s Red Sea mills and for the opening of Ras Issa port, which has been closed since 2017 (see below ‘Fire Damages WFP Food Aid in Hudaydah’). Meanwhile, commercial fuel imports through Hudaydah and Salif ports were higher than at any point in 2017, but commercial food imports plummeted to their lowest since the UN Verification and Inspection Mechanism for Yemen (UNVIM) began reporting in 2016. Touching on the economic situation in the country, Lowcock called for further interventions to stabilize the Yemeni rial (YR), noting that without additional measures the International Monetary Fund has estimated a depreciation to more than YR700 to US$1 in 2019. 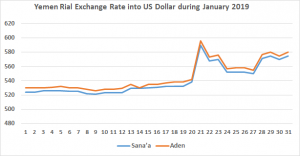 As January ended the YR was trading at YR570 per US$1 (see above ‘Yemeni Rial Exchange Rate’). Given that Yemen is overwhelmingly dependent on imports to feed the population, even small depreciations in YR value pose an outsized food security threat for millions of Yemenis already on the cusp of famine. On January 25, two grain silos were damaged in a fire at the Red Sea mills, on the eastern outskirts of Hudaydah City. The UN said the fire was likely a result of mortar shelling. Some 51,000 metric tons of wheat belonging to the World Food Programme (WFP) was stored at the mills, enough to feed around 3.7 million people for a month. The WFP said it had been unable to access the stock – which accounts for a quarter of its wheat supplies in Yemen – since September 2018, due to fighting in Hudaydah. The WFP urgently needs to access the mills to assess the damage and transport any unaffected wheat stocks to areas of Yemen where it is desperately needed, WFP Country Director Stephen Anderson said. The UN Humanitarian Coordinator for Yemen Lise Grande described the loss as “heartbreaking” and noted that 20 million Yemenis were hungry and 250,000 faced near starvation. “This is the first time we are seeing conditions like this. We need this wheat,” Grande added. Houthi officials responded on January 1 to allegations by the WFP that food aid was being stolen in areas controlled by Houthi authorities. An AP investigation published on December 31, 2018 found that factions and militias on all sides of the conflict were blocking food aid, diverting it to front lines and selling it for profit. The WFP then said it had uncovered evidence that an organization affiliated to Houthi authorities had misused aid and committed fraud. The WFP threatened to suspend some food shipments to Yemen if Houthi authorities did not take action within 10 days to investigate and stop the theft. The head of the Houthi’s Supreme Revolutionary Council Mohammad Ali al-Houthi responded that the WFP had not communicated officially with Houthi authorities and called on the UN agency to provide proof for its allegations. He accused the WFP of distributing “rotten food” in Yemen, which he said Houthi authorities had blocked because it was not suitable for human consumption. Al-Houthi also said the WFP was politicized and that the allegations of theft reflected the food agency’s “subordination” to the US and the UK. On January 6, the Yemeni government’s minister of local administration, Abdul Raqeeb Fatah, claimed that Houthi forces had stolen 65 percent of the humanitarian assistance sent to Yemen through Hudaydah port. He also accused Houthi militants of looting some 700 trucks carrying assistance, and detaining more than 88 relief and commercial vessels at Hudaydah and Saleef ports. Responding to the WFP’s threats to suspend some food aid to Yemen, on January 9 more than 35 local organizations and charities called on the UN agency to reveal the corruption it alleged surrounded its work. The groups said the WFP’s “silence” was considered “collusion with the authorities to loot food from the mouths of the hungry people in Yemen,” the AP reported. In a briefing to the UNSC on January 9, Under-Secretary-General for Humanitarian Affairs and Emergency Relief Coordinator Mark Lowcock said that the UN took misappropriation of aid seriously and had already contracted independent third-party monitors in autumn 2018. They found that 95 percent of intended food aid beneficiaries across Yemen were receiving food aid, although in some cases rations were incomplete. “These gaps could potentially be due to funding or access constraints, or other problems,” Lowcock said. January 2: UN DISPATCH reported that nearly 150,000 migrants arrived to Yemen in 2018, more than the number of irregular migrants who arrived in Europe that year. January 3: Researchers said that the strain of cholera that caused the deadliest cholera epidemic in recorded history originated in East Africa and was brought to Yemen by migrants. The Yemeni health ministry reported almost 380,000 suspected cases of cholera between January 1, 2018 and January 6, 2019, according to the World Health Organization (WHO), including 517 deaths. More than 1.4 million Yemenis are suspected to have contracted cholera since October 2016, the WHO said. January 8: The Emirates Red Crescent opened a health center in al-Jubairah district in Hudaydah to provide services to 100,000 people. January 9: The UN reported that “very limited numbers” of displaced people had returned to Hudaydah over the previous two weeks. Meanwhile, intermittent fire in Kilo 7 in Hudaydah City led to the displacement of 70 families. January 18: Yemen country director of Save the Children Tamer Kirolos urged the parliaments of arms dealing countries “to take the historical responsibility and instruct their governments to stop all sales of military weapons or equipment to any party to the conflict in Yemen.” In a statement, he noted that 85,000 children may have died of extreme hunger since the war began. January 25: In an update to the UNSC, the WFP and the Food and Agriculture Organization said that the crisis in Yemen reached a critical point in late 2018. Around 65,000 people had reached the level of catastrophe (IPC Phase 5) and more than half the population were in urgent need of food and livelihood assistance. Without humanitarian assistance, a number of districts would likely be in famine, the UN agencies said. January 27: In Hajjah governorate, fighting displaced more than 300 families from Harad and Haryan to Abs during three weeks in January, according to a UN situation report. Abs district already hosts around 23,000 IDPs, many of whom have suffered multiple displacements and live in dire conditions, the UN said. On January 28, Houthi authorities detained Saferworld Country Director Awfa al-Naami and her colleague in Sana’a. The Houthi-run National Security Bureau detained the NGO staff after they were called in for questioning at around 12:00 pm. Al-Naami has faced interrogation before and in recent months has been subject to threats and intimidation by Houthi authorities. More than a dozen and local, regional and international organizations signed an appeal calling for al-Naami’s immediate and unconditional release. Houthi authorities are holding dozens of women without charge, and torturing them and blackmailing their families, according to allegations by the Yemen Organization for Combating Human Trafficking, reported by the AP on January 17. The organization’s founder Nabil Fadel said that Houthi authorities had been detaining women in recent months over allegations of prostitution and collaboration with the Saudi-led military coalition. A Yemeni lawyer told the AP that women had been rounded up in cafés and parks, and that families were searching for their missing daughters. Once granted release, the women were secretly detained in villas across Sana’a, the lawyer said. The Houthil-run Interior Ministry responded to the allegations by saying they were rumors spread by the “mouthpieces of the mercenaries.” It said there were no secret prisons or arbitrary detentions, and that it would hold those behind the reports to account. On January 23, the UN Human Rights Council’s (UNHRC) 32nd Session of Universal Periodic Review (UPR) addressed Yemen. This entailed UN member states examining the Yemen’s human rights record over the past five years. The internationally recognized Yemeni government submitted and presented its own report at the UNHRC, as did civil society groups. The latter include the report ‘Yemen’s obligations to respect, protect, and fulfil the right to mental health’, jointly submitted by the Sana’a Center, Columbia Law School Human Rights Clinic, and the Brown School at Washington University. January 19: Airstrikes by the Saudi-led military coalition hit seven military facilities in Sana’a, according to a coalition spokesman. The AP reported that the strikes hit a food factory, killing two workers. No other fatalities were reported, although other civilians were said to be wounded. A plastics factory was hit, causing a large fire, the AP said. The airstrikes were the first by the coalition since the Stockholm Agreement was signed in December 2018 (see above ‘Coalition Airstrikes’). January 21: Houthi forces stormed two homes in Dhamar and commandeered them as their headquarters, Al Masdar reported. Houthi gunmen also looted the properties, according to the report. January 25: One child and five soldiers were killed when two land mines exploded in al-Bayda. A passenger vehicle set off the first land mine, killing a child and wounding five adults. The soldiers rushed to help the wounded, and were killed when a second landmine detonated, Yemeni government security officials told the AP. The officials said Houthi forces had planted thousands of land mines across Yemen. The same week, five staff of an international demining team were killed by a landmine in Marib. January 27: Eight people were killed and 30 injured when unknown assailants shelled a camp for displaced people in Hajjah, according to the UN. In January, a report by the UN Panel of Experts on Yemen was circulated among UNSC members states and discussed at a closed meeting of the council’s Yemen Sanctions Committee on January 18. The report investigated and assessed economic, humanitarian, security and human rights developments during 2018. The panel had met with a number of officials from the the internationally recognized Yemeni government, including President Hadi and then Prime Minister Ahmed Bin Dagher. However, the armed Houthi movement refused to cooperate with the panel, so the experts were unable to meet Houthi authorities or visit Sana’a. The Houthi authorities accused the panel of reporting false information in its 2017 report. Last month’s report painted a bleak picture of the situation in Yemen, with a strong focus on the war economy and impediments to the delivery of humanitarian aid to and within Yemen, according to a copy of the report seen by the Sana’a Center. The report also gave greater attention to violations and obstructions by Houthi forces than the panel’s previous report. Among the new findings, the Panel of Experts indicated that Houthi forces had advanced their capabilities in developing extended-range unmanned aerial vehicles (UAVs) that could strike targets deep inside Saudi Arabia or the United Arab Emirates (see above ‘Houthi UAV attacks’). The panel also found that in 2018, Houthi forces were increasingly reliant on the import of high-value weapons components, which were integrated into locally assembled systems such as extended-range UAVs. This marked a change from previous years, the experts said, noting that in 2015 and 2016, complete or partially-assembled weapons systems were supplied to Houthi forces from abroad. The threat to commercial shipping increased in 2018 as Houthi forces developed and deployed sophisticated weapons like anti-ship cruise missiles and Water-Borne Improvised Explosive Devices, the panel found. The panel concluded that Houthi forces were responsible for attacks on the crude carrier Abqaiq on April 3, 2018, and against the bulk carrier Ince Inebolu on May 10, 2018. Houthi forces also targeted a vessel carrying wheat to Yemen, the experts said, noting that this endangered the delivery of humanitarian assistance and increased the transaction costs of imports to Yemen. The warring parties were implicated in obstructing the delivery of aid with excessive delays to shipments. The report notes that the Saudi-led military coalition’s continued ban on commercial flights from Sana’a International Airport was preventing civilians from accessing medical treatment outside the country. Highlighting a link between food insecurity and the conflict, the panel said that hunger was a common reason for young men and children to sign up as Houthi fighters, as “people know that recruits will have access to food.” Recruits tend to come from the poorest families in rural areas, and can be as young as 16, the report said, adding that the majority were illiterate. The panel reported that fuel from Iran was being used to finance the Houthi forces. The experts identified companies inside and outside Yemen operating as front companies using false documentation to conceal a fuel donation to an unidentified sanctioned individual. The revenue from the sale of this fuel was used “to finance the Houthi war effort,” the panel said. The fuel was loaded at ports in Iran using fake documents to avoid inspection by the UN Verification and Inspection Mechanism (UNVIM) for Yemen. The panel also observed that the authority of the internationally recognized government continued to erode through 2018. The panel pointed to four factors: the proliferation of militia groups and lack of de facto control over proxy military forces armed and funded by Saudi Arabia and the UAE; the challenges posed by the secessionist Southern Transitional Council (STC) and its affiliates; the apparent lack of control over revenues from natural resources; and the continued control over Sana’a and other northern governorates by Houthi forces. The panel’s report lists nine recommendations – six to the Sanctions Committee and three to the UNSC. The experts recommended that the UNSC should remind the Yemeni government and other parties to the conflict that corruption is a significant threat to peace and security in Yemen, and should urge the Houthis to ensure respect for humanitarian actors’ independence, neutrality and independence. It also suggested that the UNSC should remind the Yemeni government of its responsibilities to ensure adequate food for all Yemenis, and to ensure that import mechanisms facilitated the entry of food to all parts of Yemen. The panel’s recommendations to the committee included measures to enhance the capacity of the UNVIM to identify networks using false documents. It also suggested that the committee should alert the International Maritime Organization of the risks posed by missiles and explosive devices in the Red Sea, and should notify the International Civil Aviation Organization of risks posed by IAVs and loitering munitions to busy international airports on the Arabian Peninsula. On January 30, lawmakers reintroduced legislation to end US involvement in the Yemen conflict. House Joint Resolution 37 and Senate Joint Resolution 7 invoke the War Powers Act, which asserts Congress’ sole authority to authorize the use of military force. In December, the US Senate voted to pass similar legislation – the first time a war powers resolution has passed a chamber of Congress. House Republicans blocked voting on a similar resolution in December, but with Democrats in key leadership positions following the 2018 midterm elections, H.J.Res 37 is almost certain to reach the floor. Rep. Ro Khanna (D-CA), who introduced the legislation said he expected a vote to take place in February. Should the legislation pass both the House and the Senate, the White House has already indicated that President Donald Trump will veto it. There has also been a long-running debate over the constitutionality of the War Powers Act, which may obstruct its passage. Nevertheless, the legislation will add to the political pressure on the Trump administration, which faced growing criticism in 2018 over its support for the Saudi-led military coalition in Yemen. January 2: The US Senate confirmed Christopher Henzel as the new US ambassador to Yemen, replacing Matthew Tueller. Henzel has been the US Chargé d’Affaires at the US embassy in Riyadh since 2016, and faced a heated Senate hearing in December over coalition actions in Yemen. January 7: US Central Command reported that it conducted a total of 36 strikes against targets in Yemen during 2018 — a marked decline from the 127 operations recorded for 2017. It is possible that not all strikes have been declared, given the US military’s established record of underreporting its use of drone strikes. January 8: The Intercept released a previously unpublished Department of Defense report which said that there was no evidence that Saudi-led coalition member states had abused detainees in prisons in Yemen. A June 2017 investigation by the AP claimed that the UAE ran a network of secret prisons in southern Yemen where abuse and torture were rampant. The UN Panel of Experts also accused the UAE of violations of international humanitarian law and international human rights law in their report for 2017, citing arbitrary detention and mistreatment of prisoners. A 2018 annual defense spending bill required the DoD to provide a report to Congress assessing the Saudi-led coalition’s compliance with international humanitarian law. The UK division of the international Control Arms Coalition submitted a report on January 23 to the Committee on Arms Export Control, a British parliamentary committee investigating UK arms exports. The report focused on the disparity between the UK’s international law obligations and its arms exports to members of the Saudi-led military coalition. Among other issues, the report stressed that the UK remained one of the main arms suppliers to coalition members, despite ongoing serious violations of international humanitarian law in Yemen. The report noted that the UK was falling behind other European states that successively halted the issuing of arms export licenses to coalition members in 2018. January 8: For the first time since the 2015 Iran nuclear deal, the European Union imposed sanctions on Iran, following alleged Iranian assassination campaigns against exiled dissidents on European soil. Since early 2018 the UK, Germany, France and Italy have been in talks with Iran to save the nuclear agreement, which the US announced it was pulling out of in May 2018. These negotiations have also concerned Iran’s wider regional engagement, including its role in the Yemen conflict and related peace efforts. January 14: A joint European delegation, including the Head of the EU Delegation to Yemen Antonia Calvo-Puerta and French Ambassador Christian Testot, visited Aden for the first time since the outbreak of the Yemen war. They met with Yemeni Prime Minister Maeen Abdulmalek Saeed and the governor of the central bank in Aden. January 24: The human rights subcommittee of the European Parliament held an exchange of views on the current humanitarian and human rights situation in Yemen, hearing from Yemeni and international rights activists and experts. January 25: Reuters reported that the European Commission had added Saudi Arabia to a draft list of states considered to pose a threat to the financial system of the EU due to lax controls over the financing of terrorism and money laundering. The updated list is yet to be formally adopted. January 25: The Guardian reported that UK Foreign Secretary Jeremy Hunt was the first European foreign minister to agree to attend a controversial US-organized summit on Iran, to be held in Warsaw in mid-February. Hunt’s stipulation was that the UK, the US, the UAE and Saudi Arabia meet to discuss the current situation in Yemen on its margins. The report was prepared by (in alphabetical order): Ali Abdullah, Waleed Alhariri, Ryan Bailey, Anthony Biswell, Hamza al-Hamadi, Gregory Johnsen, Sala Khaled, Spencer Osberg, Hannah Patchett, Hussam Radman, Victoria K. Sauer, Holly Topham, and Aisha al-Warraq.